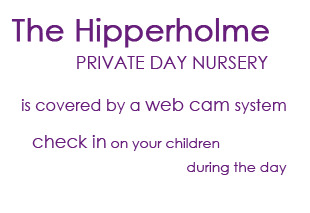 Welcome to The Hipperholme Private Day Nursery. We would like to thank you for visiting our website. We have designed this website to provide parents with some brief information about our Nursery and what services we provide. If you are considering our nursery for your child’s care, we recognise that you will want to know a lot more about us than we can provide on a website. Prospective parents are always welcome to visit the Nursery when ever they wish and as many times as they wish before making a final decision about their child’s care. No appointment is necessary, just drop in. You may also contact us using the telephone numbers and email addresses provided within this site, if you require further information. Please use the buttons below to navigate the site.